What are the 3 things needed to build a brand in mobile-first world? Facebook’s Sandhia Devanathan gives the basics, as she and other speakers will share more in the 1st digital conference in October aimed to help businesses adapt to digital marketing. MANILA, Philippines – After a decade of disruption, the digital age has become the new mainstream as it continuously changes media, marketing, and business processes across industries. 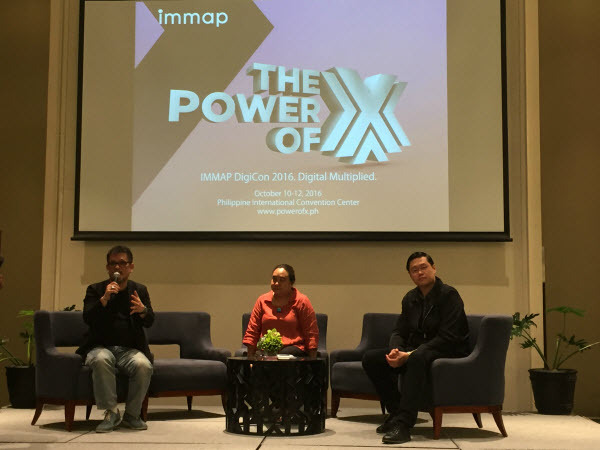 The Internet and Mobile Marketing Association of the Philippines (IMMAP) recognizes this shift as it launched the first Digicon (Digital Conference) with the theme "The Power of X: Digital Multiplied," to be held on October 10 to 12, 2016 at the Philippine International Convention Center in Pasay City. “Digital has transformed making it a necessity for businesses… A lot of SMEs (small and medium enterprises) are asking, ‘where do we begin?’ We want them to start somewhere,” IMMAP President Margot Torres added. 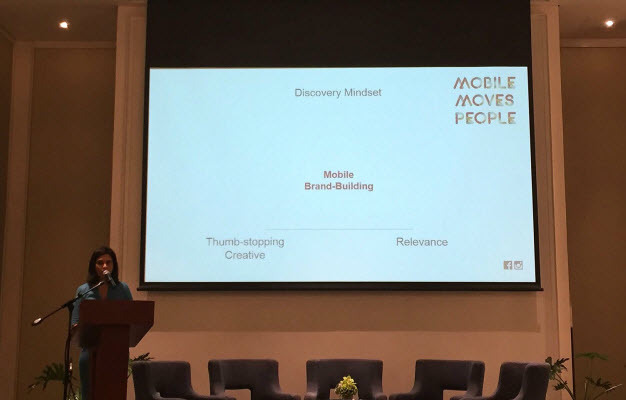 Thus, one of the speakers for the upcoming summit, Facebook Head for eCommerce in Southeast Asia, Sandhia Devanathan, said on Tuesday, April 19, that mobile has transformed the marketing tactics of brands today, and other companies need to adapt to these changes. “According to Facebook’s statistics, Filipinos spend at least three hours a day on mobile, a number they share with the rest of Southeast Asia. In a day, people check their Facebook account at least 14 times,” Devanathan said in a press conference, Tuesday to launch the upcoming digital conference. With that large number of time spent on phones, businesses will have to compete with the plethora of content online in capturing their consumers’ attention. So how do they do that? The Facebook executive named three factors. “First, brands will have to build on the discovery mindset or having a sense of serendipity for your markets,” Devanathan said. As the Facebook executive puts it, “it’s something your consumer desperately wanted but didn’t know it yet.” A curated content can easily catch the attention of consumer as they scroll their social media accounts searching for new information they want to churn. But for that meeting between the brand and the market to happen, it has to be relevant to the right market which can be done by taking advantage of data insights. “Marketers have to think of real people when creating content. It has to resonate with a particular consumer at any time of the day to make sure all the money you spend is not wasted,” Devanathan shared. The marketing expert admitted doing so could be difficult, especially when advertisers got used to TV, where all consumers are glued to a single media at a time. However, this behavior has drastically changed in the last decade, as Facebook found eight of 10 people in Southeast Asia use their mobile phones while watching TV. This is when the “thumb-stopping creative” has to be emulated for a campaign to be successful. “Brands should have the ability to move hearts. You can connect with them through video, text, and now virtual reality. Connect with your consumers,” Devanathan said. With this vast number of challenges and opportunities in the digital world, businesses are scrambling on what their next steps would be to remain relevant today. “The main objective of the summit is to help businesses make sound decisions on digital marketing. The ‘X’ means amplifying your businesses efforts in today’s age,” Digicon Chairman Donald Lim said about the digital conference during its press launch on Tuesday. “The digital congress will represent the entire digital ecosystem from mobile to media. By combining the entire ecosystem, the objective is to discover how all these brands and marketers will navigate in the digital realm,” IMMAP Vice President Ed Mapa Jr. added. The conference will converge three independent digital summits for the first time, namely, the Mobile Marketing Summit, Digital Commerce Summit, and IMMAP Summit. There will be “around 120 speakers” with no less than 50 who are regional directors of companies from various industries including Twitter, Google, Spotify, and Sephora. These business leaders will tackle 10 tracks of topics: Branding and Marketing;Content and Distribution; Start-Ups; The Digital Creative;Social and Search;eCommerce and Payments;The Digital Agency; CRM; Data and Analytics; Research and Measurement; Media and Ad Networks or what IMMAP considers the different channels where the digital media is most relevant today. The conference is also in celebration of the association’s 10th anniversary, a culmination of what it has accomplished for the past decade as some of its members have become successful digital industry leaders namely Nix Noledo of Xurpas Inc., and Brian Cu of Grab Philippines. Other activities in the three-day affair include a trade exhibit where different startups will have a chance to showcase their business solutions and IMMAP’s annual Boomerang Awards, which recognizes the best creative digital marketing campaigns over the last year. Elyssa Christine Lopez is entrepreneur.com.ph's editorial assisant/staff writer. Follow her on Twitter @elyssalopz. Kick start your day, April 19: What is President Aquino’s satisfaction rating in Q1?